The new name for Dell after it merges with EMC later in 2016 will be Dell Technologies. The new name was announced by Michael Dell, chairman and CEO of Dell Inc., at EMC World going on this week in Las Vegas and in a letter to Dell team members. Dell and EMC announced what is considered the biggest tech merger ever in October 2015. Under the definitive agreement, Dell, together with its owners, Michael S. Dell, founder, chairman, and chief executive officer of Dell, MSD Partners and Silver Lake, will acquire EMC. VMware in which EMC has a major stake will remain as a publicly-traded company. 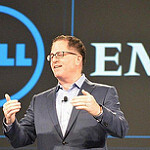 Michael Dell said Dell Technologies will include the combined technologies, companies, and brands of Dell, EMC, VMware, Pivotal, SecureWorks, RSA and Virtustream, with “Dell EMC” used for the company’s enterprise business, including products and solutions sold directly and through the channel to business and institutional customers, and the “Dell” name used for the company’s client solutions for consumers, business, and institutional customers. The total transaction is valued at $67 billion, according to Dell, and is subject to customary conditions. At the time the deal was announced, the companies said it was expected to close in the second or third quarter of Dell’s fiscal year which ends February 3, 2017 (within the months of May to October 2016). “Our vision is for a strategically aligned family of businesses that brings together our customers’ entire infrastructure - from hardware to software to services, from the edge to the core to the cloud - so they don’t have to. We will be the leaders in traditional technology of today and cloud-native infrastructure of tomorrow,” said Dell in his letter. For more information about EMC, go here, and for more information about Dell, go here.